A couple of weeks ago, I wrote about my upcoming trip to Indonesia. Back in the Netherlands, I am cherishing the new memories of everything we saw and did. Throughout Indonesia, we encountered many reminders of the shared Dutch-Indonesian colonial past. Predictably, some were rather embarrassing, such as the fact that as we were travelling, the Dutch government finally apologized half-heartedly for the atrocities committed by captain Westerling. 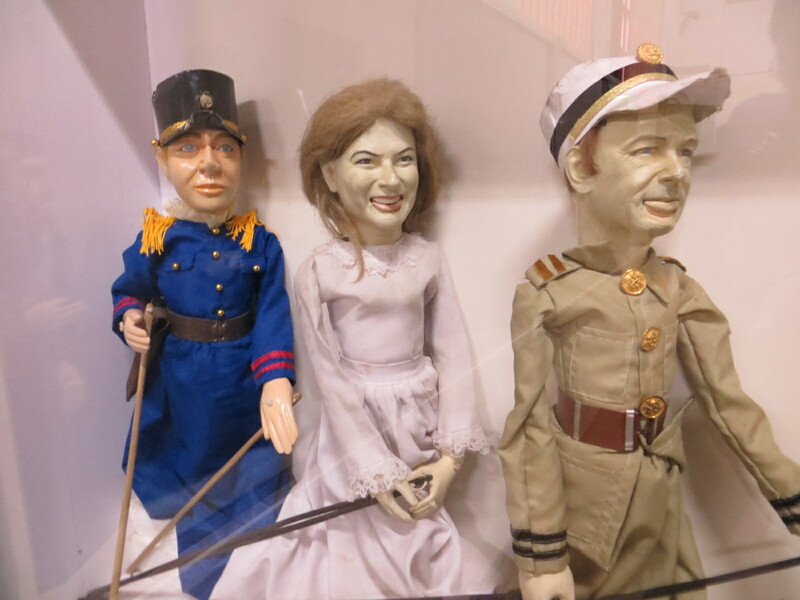 Others were endearing or even funny, such as the caricatural wajang puppets of J.P. Coen (1587-1629), founder of Batavia, in the National Wajang Museum. Understandably, in many cities little is left of Dutch colonial architecture, and finding traces of the medicine and chemistry of the eighteenth century would have required archival expeditions, something I had promised my better half to refrain from during this holiday. However, many other, more recent souvenirs of a shared history of medicine were easily found. The most enjoyable was probably a visit to the jamu factory of Nyonya Meneer in Semarang, a big harbour city in the north-east of Java, the city where my mother-in-law was born. 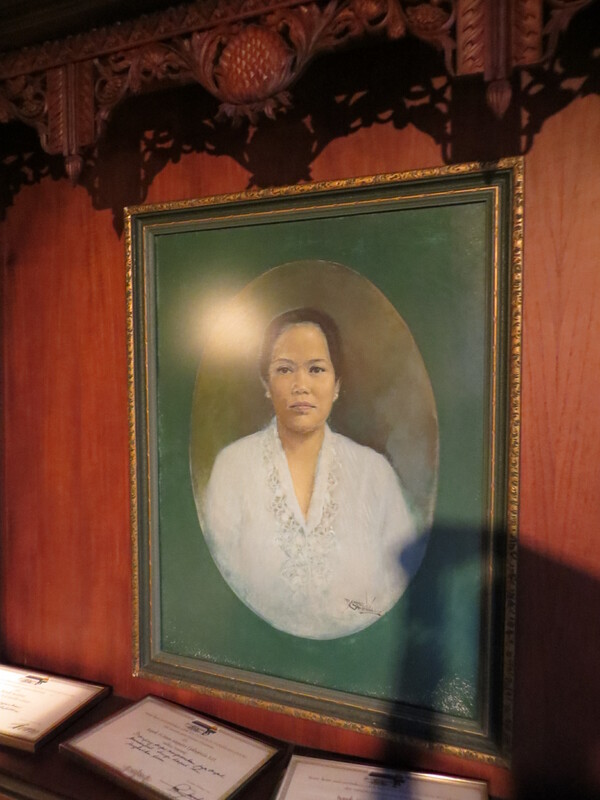 Portrait of Nyonya Meneer in the factory museum, Semarang, Indonesia. About fifty years earlier, Nyonya Meneer (1895-1978) was born in East Java. Here actual name was Lauw Ping Nio, but she probably was required to have an Indonesian name too as she was a member of the ethnic Chinese minority in Indonesia. ‘Meneer’ (which means ‘mister’ in Dutch) was likely a degeneration of the Indonesian word ‘menir,’ broken rice, which her mother was said to have craved during her pregnancy. When Nyonya’s husband suffered from severe intestinal complaints in the 1920s, Nyonya Meneer started to make him jamu medicines, traditional Indonesian herbal cures. Eventually, she set up a business to sell them to others too, and today Nyonya Meneer jamu products are sold throughout Asia. Advertisements in Dutch and Indonesian for breast-firming herbs, probably 1940s. In the small museum at the factory site, you can see a nice selection of historical documents, photographs, some of Nyonya Meneer’s personal belongings, an explanation of the production process, and objects such as raw ingredients, storage containers, product packaging, and historical production tools. In the museum, it quickly becomes clear how intertwined the lives of the Indonesians and the Dutch were in the colonial era. 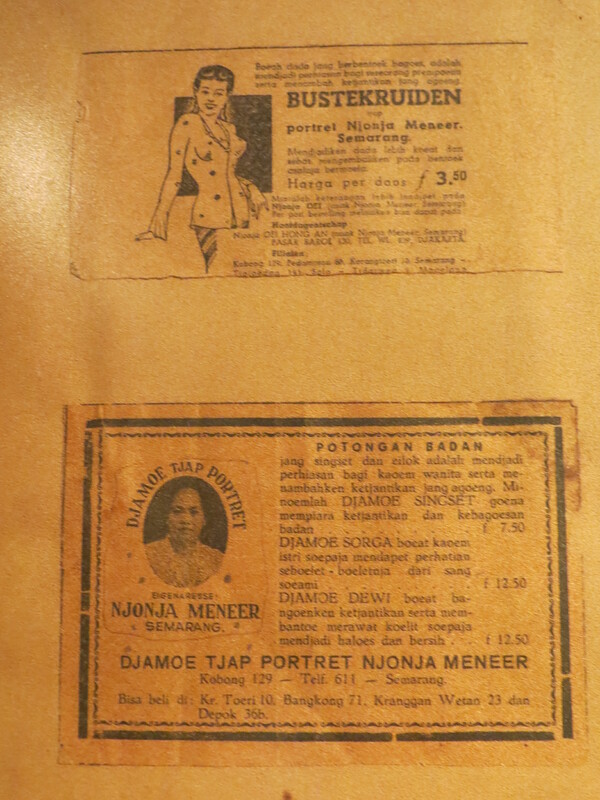 Nyonya Meneer taught herself the basics of pharmaceutics from a Dutch handbook, and many of the advertisements from before 1950 are in Dutch, as jamu was popular with both the Dutch and the Indonesians. This also shows from the fact that a 1907 Dutch handbook on the curative powers of Indonesian plants was so popular that it was updated and reprinted at least ten times in fifty years. As late as the 1980s an Indonesian translation was sold. What is interesting to see is that women, both Indonesian and Dutch, dominated the domain of jamu or traditional herbal medicine in twentieth-century Dutch Indonesia and that it was a shared domain with Semerang as its centre. 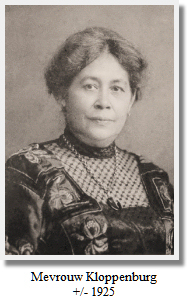 Nyonya Meneer founded an emporium and ran her company almost single-handedly for about half a century, and ‘Kloppenburg,’ the handbook written by Mrs.’s Kloppenburg-Versteegh (1862-1948) and originally published in Semarang, was a household name for Dutch women in Indonesia. The most obvious explanation for this would be that herbal medicine was traditionally the domain of women, and that women would have to deal with ill family members and manage the household budget, which may have created a market for the relatively easily obtainable jamu products. However, this is just speculation, and my visit to the Nyonya Meneer factory raised many more questions that are worth answering, such as whether Mrs. Meneer and Mrs. Kloppenburg-Versteegh ever met, how Semarang came to be the centre of Jamu production, et cetera. Who knows, maybe I or someone else will one day have a chance to investigate further. About thirteen months ago, I started this blog to keep my friends, colleagues and family updated about the work I was doing. As I have been blogging for over a year now and as I am going to discuss history blogs on a panel this week, it is time to reflect on how it all started, what it has brought me, and what the future looks like. I was inspired to start a blog of my own by Lindsey Fitzharris’ brilliant blog The Chirurgeon’s Apprentice, although I by no means intended to copy what she is doing, nor did I expect to generate the same kind of success. Lindsey has, amongst other things, gone on to appear in a variety of media, writing for the Huffington Post and crowd funding her own television series. However amazing all this is, it just would not be right for me (the camera doesn’t love me, for starters). If you look at these blogs you may be surprised to find that they vary wildly: some are personal projects, some are collectives or institutional blogs, some appear weekly, others incidentally. There are blogs that feature journal article-length pieces, while there are also blogs (like my own) that rely on shorter pieces. One is not necessarily better than the other, although it is good to realise that a certain format will be more likely to draw a particular audience. For me, writing my blog is valuable in itself, as it allows me to share finds that do not fit entirely in a ‘real’ publication, as well as to share work in progress. Moreover, blogging helps me to reflect on my own work and to communicate it to a variety of people. My research is funded with public money, so I feel obliged to show the public what I am doing with it. Obviously I could simply refer to my print publications on my faculty page, but I want to share my work more frequently, more directly, and with a broader audience. In comparison to others, mine is a small, rather unpretentious blog, but still people from seventy countries have viewed it over 4,000 times in the past year. Apart from the fact that it is nice to know that my parents and someone in Japan read my blog, it has also brought me into contact with people whom I otherwise never would have met, like Tamara Varney. My blog also got me invited as a guest blogger with The Recipes Project and I regularly receive emails from other academics, as well as from journalists and people who are simply interested in one of the topics I write about who ask questions, have helpful suggestions, or who want to share some of their work with me. Finally, the blog serves as a business card: often people look one another up on the internet before meeting at a conference, and a blog gives a quick impression of the work you’re doing. James M. Banner Jr. Being a Historian. An introduction to the professional world of history. Cambridge, Cambridge University Press, 2012. p.92.